Rodney Dangerfield Wife, Net Worth, Kids, Is He Still Alive Or Dead? Home Comedians Rodney Dangerfield Wife, Net Worth, Kids, Is He Still Alive Or Dead? Humorous and famous, Rodney Dangerfield was a stand-up comedian and actor who made the phrase “I don’t get no respect” popular across America. Blessed with an infectious charisma, Rodney had an uncanny inert ability to make people around him comfortable. Rodney Dangerfield was born in Babylon, New York on November 22, 1921. He was the youngest of two children and his birth name was Jacob Cohen. He was brought up in a Jewish family. His father, Phillip Cohen went by the name Phil Roy and he was part of a comedy juggling act at the vaudeville concert and was barely ever home. His father later abandoned the family and his mother, Dorothy Teitelbaum moved him and his sister to Queens, New York. Richmond Hill High School was where he attended high school, graduating in 1939. Life was not easy, and so to help the family out, he had to sell ice cream and deliver groceries. When he was faced with anti-semitic remarks from teachers and peers, he turned to write jokes to cope with his situation. When he turned 17, he began performing at various night clubs. He had taken the stage name Jack Roy which would later become his legal name by the time he was 19 and performing full-time. For the next couple of years and despite landing various gigs including one at a resort in upstate New York and other side jobs, he struggled financially whilst making $300 a week. Dangerfield gave up the show business in 1951 after meeting singer Joyce Indig. The pair got married and moved to New Jersey together. Their time together was blessed with two children, Brian and Melanie. Dangerfield prioritized his family needs and became an aluminum salesman. His time away from comedy was tumultuous, to say the least, he suffered from depression and his marriage suffered from so much bickering. It deteriorated to the point of divorce in 1962. The couple, however, gave the relationship another chance by remarrying in 1963, but after seven years of struggle, the marriage ended permanently in 1970. By the time he returned to comedy, he feared rejection and subsequently changed his name to Rodney Dangerfield taken from Jack Benny. During this time, he also realized that he needed an on-stage persona that his audiences could relate with. The catchphrase “I don’t get no respect” was later coined. What many consider as his big break came when he performed on The Ed Sullivan Show in the early 1970’s. Soon enough, he had other performances on The Dean Martin Show and the Tonight Show. He opened his own comedy club, Dangerfield’s in Manhattan and it allowed him to be closer to his children. The club also gave him a platform to nurture upcoming acts as well. Adam Sandler and Jerry Seinfeld were some beneficiaries. As earlier stated, Dangerfield was first married to Joyce Indig and blessed with two children. The couple divorced twice, finally in 1970. His son Brian Roy was born in 1949 and his daughter Melanie Roy-Friedman. Dangerfield remarried in 1993 to Joan Child. The pair stayed together until his death. Joan met Rodney when he came into her flower shop in Santa Monica in the early 1980’s and they remained close until they were married in 1993. She is the guardian of all of Rodney Dangerfield’s legion of intellectual work and still works hard to keep his legacy alive. Dangerfield was raised Jewish but was never really religious and even declared himself an atheist, a “logical” atheist. 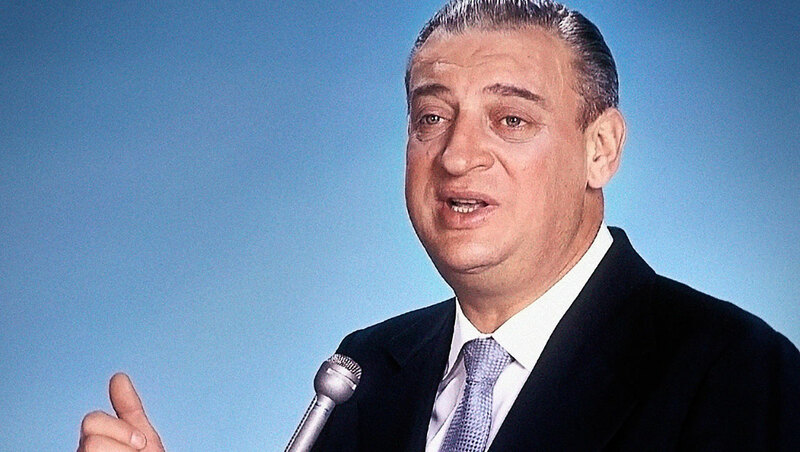 Rodney Dangerfield did not begin to be associated within the circle of comedy until he was well into his 40’s. Aside from his comedy gig, he also had a career in acting. His first was The Projectionist in 1971. He earned roles in other movies like Back To School and Easy Money. When you look through all his achievements in life you would expect that he would have earned a healthy enough pay packet and he sure did. His net worth stands at an estimated $10 million. Is He Still Alive or Dead? Sadly, the comedy legend is no longer present in the body even though his works live on. He died on October 5, 2004, after developing complications from a heart valve replacement surgery.